Transmissions can only be properly checked while in operation. Are there any unusual noises or vibrations ? Does the dozer steer and brake properly ? On clutch-brake systems, feel if the machine brakes and steers left and right equally and thoroughly. With hydrostatic systems, also check for any noise or vibration. Check engine compartment for signs of oil leaks, and coolant leaks around the top valve cover gaskets, around cylinder head gaskets, and underneath engine. 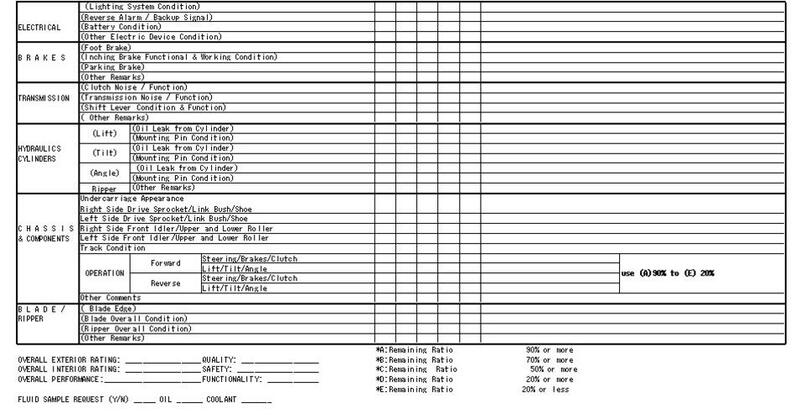 Check oil for particulates or coolant contamination. Inspect overall condition and body panels for numerous dents, structural damage, cracks, rust, and weld repairs. 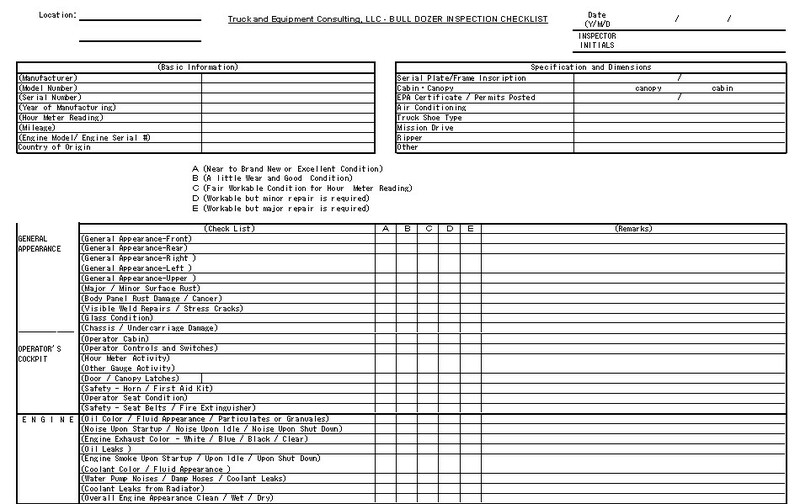 This could indicate signs of abuse, excessive loads, or severe-use applictaions. Check all hydraulic cylinders for dents, damage, and overall appearance. Check for leaks from cylinders, hoses, and fittings. Check ROPS. Look for dents, cracks, or weld repairs. 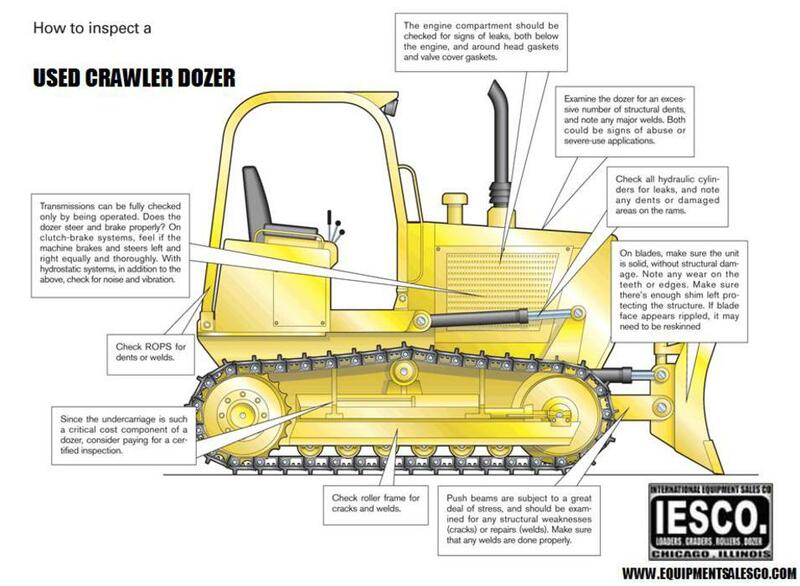 The undercarriage is a very critical and important cost component of a dozer. Carefully inspect for any damage, rust, cancer, weld repairs. Push beams are subject to a great deal of stress and structural load. Carefully examine for overall appearance and note any damage, cracks, rust, cancer, or weld repairs. Check mounting points. Measure blade width and depth. Look for wear and damage on bottom, sides, and cutting edge. Note any wear on teeth and edges. Make sure there is enough shim protecting the structure. If blade face appears rippled, it may need reskinning.